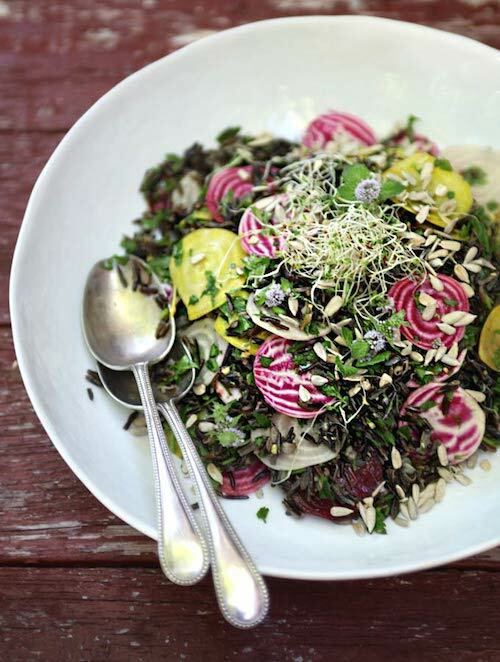 Today I am sharing with you Sarah’s Sprouted Wild Rice and Beet Salad with Ginger Dressing as well as some exciting news about her new book! 6-8 small beets in various colours, if possible. 1. Rinse rice well and place in a glass jar or bowl with fresh, pure water. Let soak outside of the fridge overnight. In the morning drain and rinse the rice, then cover with fresh water and put in the fridge. Drain and rinse the rice at least twice per day for 2-3 days until the rice has “bloomed” – some or all of the grains will have split open, and it should be tender to eat. 2. Once you have sprouted the rice, drain and rinse and place in a large bowl. Whisk dressing ingredients together, then pour half over the rice and fold to coat. 3. Peel beets. Using a mandoline or shape knife, slice beets into thin rounds. Place in the bowl with rice and remaining ingredients. Pour the rest of the dressing over and toss. Garnish with sprouts and mint flowers, if you have some. Serve immediately. Note: if your rice remains crunchy and none of the grains split after 3 days, your rice might be too old for the sprouting method. Instead, simply boil the rice you’ve tried to sprout, and it should cook in 15-20 minutes. Then buy some new rice and make sure to check the packing and expiry dates before purchasing to ensure freshness. Give it another shot! 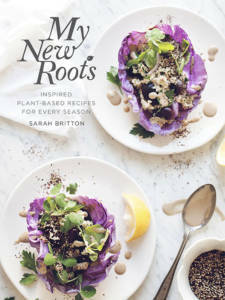 Very much like Sarah’s blog where this deliciously divine recipe is from, her cookbook is inspired by the seasons and eating in connection with nature, as often as possible. Each recipe features health and nutrition information on the key ingredients, so you will always know a little something special about the health benefits in your favourite dishes. To pre-order your copy of Sarah’s gorgeous book click here. ORIGINAL SOURCE OF RECIPE CAN BE FOUND HERE.